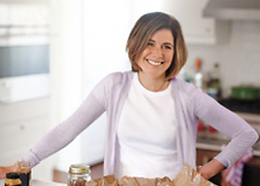 I’ve worked with a lot of creative people in my life, but right up there at the top of the list is Vanessa Holden, who I met when she was creative director of Real Simple, and who went on to become editor-in-chief of Martha Stewart and creative director at West Elm. Her most impressive credential, though, might be Soul Safari, the conference-slash-revolution she’s organizing around a simple idea: Everyone is creative, and creativity has the power to change lives. (Next up: NYC.) Today, as part of my Family Rituals Series, she guest-posts about the Pavlova tradition that she and her husband Simon Andrews have carried with them from Australia. Come to think of it, maybe it’s the Pavlova that qualifies as her most impressive credential. Take it away, Vanessa! We’re pretty loose (read: useless) with maintaining traditions in any traditional sense. As Australians living in New York for over a decade now, we’ve attended as many Thanksgivings and Christmases as “orphans” as we’ve hosted; we’ve been lucky to join friends all over the country as they celebrate big milestones, as well as Easter, Memorial Day, the Fourth, Labor Day, and Halloween; our kids have often celebrated birthdays away at camp (for the bigger kids — us –great birthdays are about surprises than more of the same); and we’ve headed home only a handful of times to celebrate birthdays or holidays with our family and friends in and around Sydney. The cadence of our lives is loose and flexible, and very much last-minute – we’re pretty spontaneous party-planners. We will come over for a drink or dinner at the drop of a hat, and like to get out of the city and travel whenever we can, which means that the traditions we do have — certainly the ones around food — are the the ones we can make happen quickly and yes, truly effortlessly. Here, the tradition of the pavlova, or “The Pav,” reigns above all else. Growing up in Australia, the Pav was served as an all-in dessert after casual backyard barbecues or sophisticated grown-up dinner parties – we had it for Christmas as well as for birthdays, and especially in the summer. A friend might bring one over, but you never bought a Pav from the store — Pavs were made at home, and everyone’s Mum made her own version. There’s something magic about a Pav — it makes any gathering a celebration. Something about their flamboyant piled-high swooshiness that says Wow! We’re here! Isn’t this great? I love you! 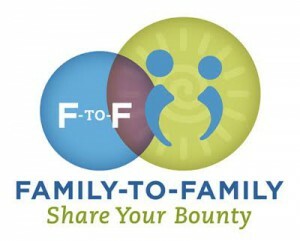 Isn’t this fun?! For us, it’s a dessert that makes any get-together special, but not fancy, decadent but not overdone. 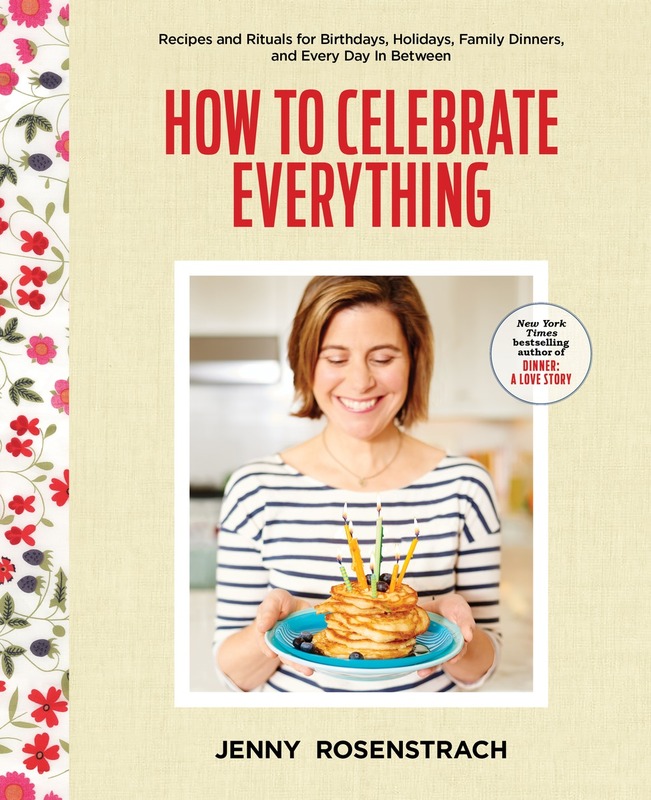 Pavs are made for first birthdays as well as fortieths; they’re requested for birthdays as well as holidays; for the Fourth of July as well as Christmas; they’re the iconic dessert of Australia, and make every event we have feel more rooted and us. Pavlovas float to the table like fluffy, dreamy delicious clouds, inevitably received with oohs and aahs and wows. All the drama of a Pav belies the simplicity of its creation – it’s a short, easily memorized recipe of really just sugar, eggs, and air. Forgiving in form and flavor – it’s hard to mess it up, and even better when you make it your own. Eventually everyone experiments with their own favorite flavors or shapes, traditional and some decidedly not. In the quintessential Australian version (the one our Mums, and everyone’s Mums, used to make) a light, crisp-chewy meringue nest comes perfectly crisp on the outside, marshmallow-fluffy on the inside, and is topped with a generous layer of whipped cream, sliced bananas and passion fruit pulp. Both of our Mums added strawberries and sliced kiwi fruit too – sometimes carefully placed, sometimes tumbled on. This is the version our kids still love the most: the Australian Classic. Passion fruit is hard to find in NYC, so a simple summer berry and cream version became our go-to, but we’ve just as simply drizzled it with salted caramel or hot fudge. For my fortieth birthday, Simon piled the three separate pavlovas four layers high, layered each of them with St. Germain-infused whipped cream, all confetti’d with piles of red berries. For a Fourth party, we’ve made a giant pavlova, overflowing with the red (strawberries and raspberries), white and blue (blueberries), an oversize, decadent centerpiece. Once lunch was over, everyone dug in with a spoon, right there at the table. For Christmas we’ve made a pavlova “tree,” dressed it with pomegranate seeds, cranberries and golden pistachio toffee shards, all drizzled it with burnt toffee caramel. On a New Year’s Eve, the chocolate-swirled meringue base cracked and fell to pieces – but we piled it high with dark cherries, espresso cream, and cocoa nibs and presented it deconstructed and glittering with sparklers – a perfectly imperfect mess! There are endless ways to make a pavlova your own. Take a crispy-chewy meringue to another level by topping it with coconut (it toasts beautifully as it bakes), or studding it with toasted hazelnuts or walnuts, or nuggets of dark chocolate, or swirling it with pomegranate syrup. Blanket the base with dulce de leche, salted caramel, berry coulis or tangy fruit curd. Fold macerated berries or pureed fruit into the whipped cream, or flavor it with liquer, or rose- or orange blossom-water. Swap whipped cream for yoghurt or mascarpone blends, or ditch it entirely for ice cream, semi-freddo, sorbet or gelato. Here’s our basic recipe and three simple versions – but think of these suggestions as just the beginnings of your own. We think traditions are better shared, and certainly more delicious, that way. Preheat your oven to 250° F making sure the rack is in center of oven. In the bowl of your electric mixer, with the whisk attachment, beat the egg whites on medium speed with a small pinch of salt until they hold soft peaks. Start adding the sugar, a tablespoon at a time, and continue to beat, on high speed, until the meringue holds very stiff and shiny peaks. The meringue should feel smooth, not gritty when rubbed between your fingers. Beat in the vanilla extract. Sprinkle the vinegar and cornstarch over the top of the meringue and, with a rubber spatula, gently fold in. Spread the meringue inside the circle drawn on the parchment paper. Bake for 60 to 75 minutes or until the outside is dry and a very pale cream color. Turn the oven off and let the meringue cool completely in the oven. Just before serving, gently place the meringue onto a serving plate and whip the cream in your electric mixer until soft peaks form. Spoon the lightly whipped cream into the center of the meringue and gently tumble the fruit on top. Whisk together juice, zest, sugar cornstarch, and eggs in a 2-quart heavy saucepan. Stir in butter and cook over moderately low heat, whisking frequently, until curd is thick enough to hold marks of whisk and first bubble appears on surface, about 6 to 8 minutes. Transfer lemon curd to a bowl and chill, its surface covered with plastic wrap, until cold, at least 1 hour. 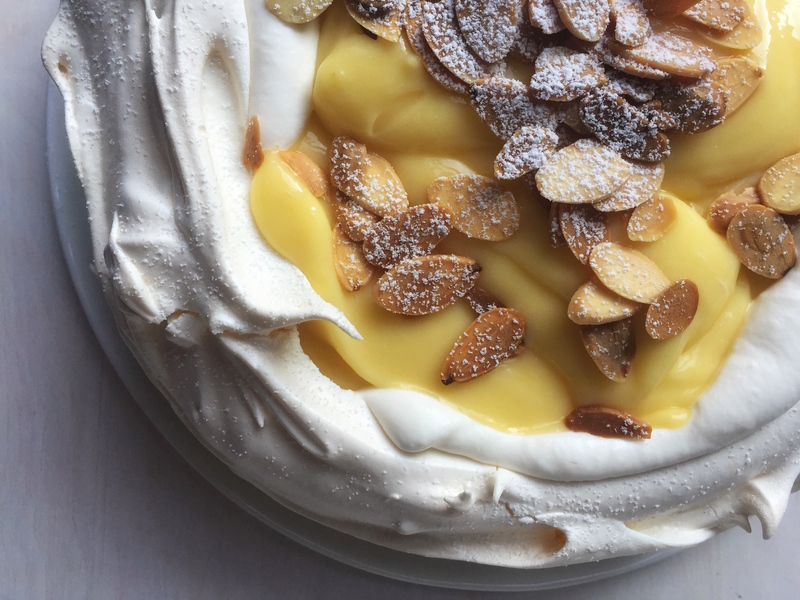 Top the pavlova with the whipped cream then lemon curd and toasted almonds. Dust with powdered sugar. For a richer, tangier variation, substitute in half greek yogurt with half amount whipped cream. Layer honeycomb, sliced blackberries and ripe figs, and finish with a drizzle of honey. Best Column Ever!!! Life-Changing and Affirming. There is a fine line between Palova, Meringue, and Marshmallow. Another variation on this is Eton Mess (British) which one must try. We are a big pavlova family too! Its our favorite dessert and reminds me of family celebrations growing up in the UK. Plus, it’s so easy to make! Love! 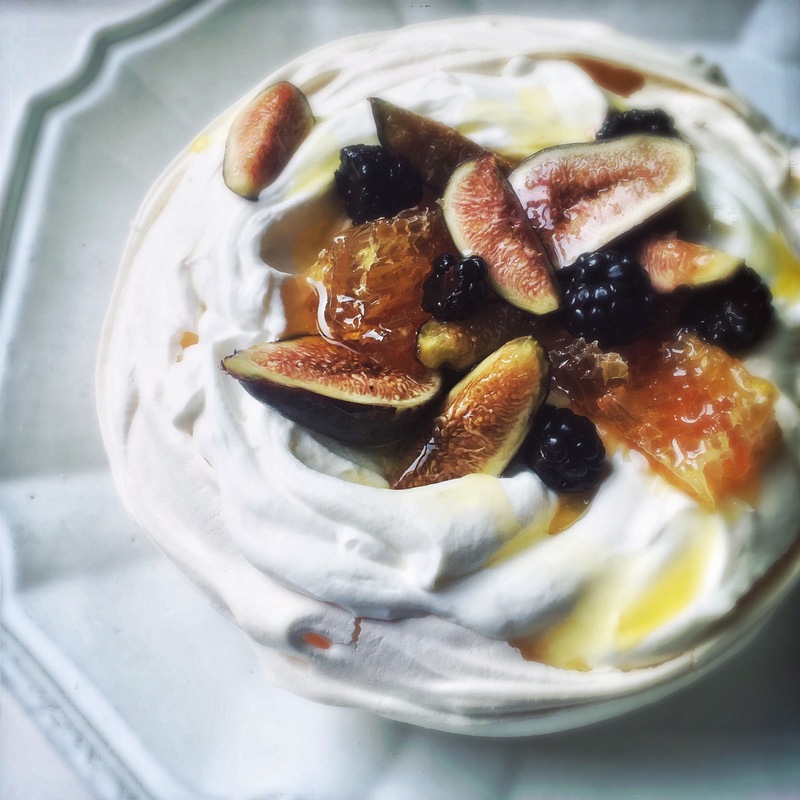 First started making pavlovas after watching Nigella 15 year ago…such a versatile dessert. And good for gluten-free eaters too! I love that they have pavlovas to remind them of home. We all lead different lives and sometimes that takes us far from home but it’s the small things that keep traditions alive. Yum!! I recently made a pavalova for the first time! I mixed lemon curd and whipped cream 50/50, and the result was amazing. When I was a teenager, I’ve been fascinated with ballet dancing and so as with Anna Pavlova. Once I’d heard about this meringue-based dessert,I got crazy about it. I admire your own version of Pavlova. Is it weird that the thing that stood out most to me here was that passionfruit is hard to come by in NYC? It seems to be everywhere in London! We have pavlova or pavlova based dessert every Christmas. By far I adore the lemon curd, whipped cream version topped with all sorts of berries and mango slices but there have been variations with a layer of blood orange jelly or Iranian rose flavoured fairy floss with stars made from rice paper as well…my sister and adult daughter have a friendly competition and alternate each year. Of course we’re Australian! I’m intrigued by the idea of making a pavlova, but rarely have occasion to bring dessert somewhere and have a small family (and of the three of us, only two will eat dessert). 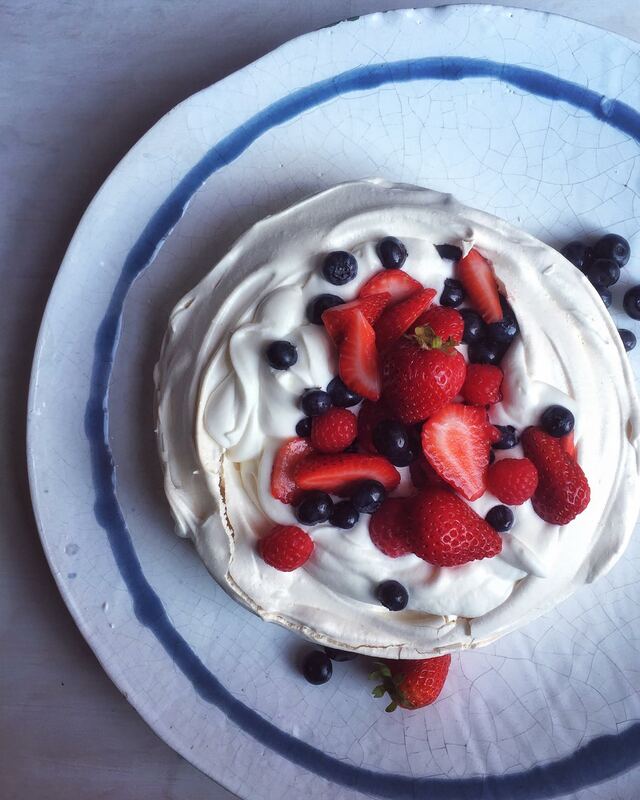 Does the pavlova need to be eaten right away or will it keep? It seems like the wet ingredients would make the pavlova get chewy if it were stored. I know it wouldn’t have the same celebratory effect, but I’m thinking of making individual meringues and topping as needed . . . . I made this the other day (for a bon voyage for my mom, though she was only going away for a week and I was looking for something to celebrate) and loved it. It was just was you said: easy, special, stress-free, celebratory. Now, I’m making another one to herald her return. Yum! I loved this post! I made the lemon curd and honey fig versions for a baby shower today. They were beautiful and delicious! Thank you Vanessa and Jenny! Just made pavlova for the first time. One question: it seems to be “weeping” a bit – even during baking, I could see some sirup drops forming on the bottom outside.